Up to 80 percent of Raqqa, the Syrian city that was captured from jihadists by US-backed militias last week, is destroyed and covered with road mines left behind by Islamic State (IS, formerly ISIS/ISIL). A Radio France correspondent described the scene as “Hell on Earth” as he posted horrific images of the destroyed city on social media. “The situation here is relatively calm. The fighting has stopped, though some sporadic shots can be still heard, including those celebrating IS’ defeat. There’s a huge number of road mines here." "Between 70 and 80 percent of Raqqa is mined. There are teams of de-mining experts to neutralize land mines left by Islamic State militants in their de facto capital,” Omar Ouahmane said on Sunday. — Omar Ouahmane (@ouahmane_omar) 23 октября 2017 г. — Omar Ouahmane (@ouahmane_omar) 22 октября 2017 г. — Omar Ouahmane (@ouahmane_omar) 21 октября 2017 г. The French journalist made the comments while standing just a short distance from the famous Raqqa stadium. “Jihadists turned it into a prison. Executions took place here,” he said. Another journalist, France 2 reporter Arnaud Comte said that some 80 percent of Raqqa has been destroyed. "[It’s] a ghost town where everything is frozen. Hell on earth,” he wrote on Twitter, posting heart-wrenching images of the city. — Arnaud Comte (@arnaudcomte) 22 октября 2017 г. — Arnaud Comte (@arnaudcomte) 23 октября 2017 г.
Raqqa, which has served as the Syrian stronghold of terrorist group IS since January 2014, was seized by the US-backed group Syrian Democratic Forces last week. Most residential buildings in the city are believed to have been rendered uninhabitable during the fighting, which involved massive bombardment by the US-led coalition’s airstrikes and artillery shelling. Before the war, the city had some 220,000 residents. 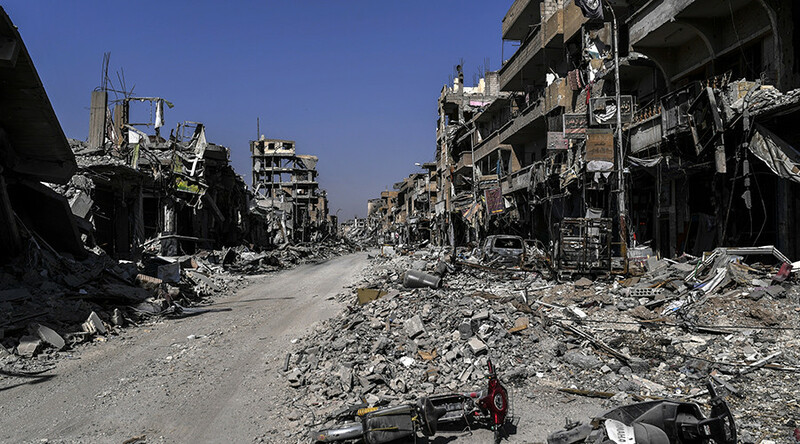 The outbreak of violence caused mass migration, with tens of thousands arriving in Raqqa throughout the years, but the city’s Kurdish minority was targeted with evictions and executions under IS rule. It is estimated that 200,000 still lived there at the beginning of the siege last June. The destruction caused to Raqqa is comparable with the infamous Allied bombing of Dresden in 1945, the Russian Defense Ministry said on Sunday, adding that the US-led coalition may be rushing to pour money into Raqqa to cover up the aftermath. “Raqqa’s fate calls to mind that of Dresden in 1945, levelled by the US-British bombings,” Defense Ministry Spokesman Gen. Igor Konashenkov said.